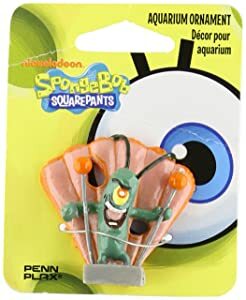 The thing that makes Spongebob aquarium decorations ideal for your fish tank design is that the entire cartoon is based on life underwater. The main character is a sea sponge, his best friend is a starfish, his neighbor is a squid and his boss is a crab. It’s super easy to build a theme around this cartoon series. How to set up a Spongebob fish tank? The Spongebob theme is probably the most fun theme I have ever seen and highly recommend it if you have kids, they would love it. 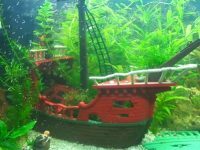 It requires extremely little artistic flair and is one of the easiest fish tank decorations to find on sale. All of these ornaments are awesome and you can get a set of them through the following button to fulfill your setup. 1. 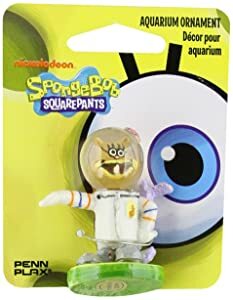 Spongebob Squarepants: Definitely a must for any Spongebob aquarium theme. He has the largest selection to choose from. 2. Patrick Starfish: Spongebob’s dim witted friend. It’s great to have a combination of both characters. There are a few ornaments that combine both characters into one. 3. 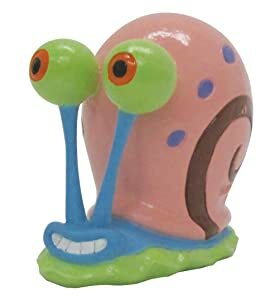 Gary The Snail: Spongebob’s pet. A minor character. 4. Mr Eugene Krabs: Spongebob’s boss and the owner of The Krusty Krab. He loves money. 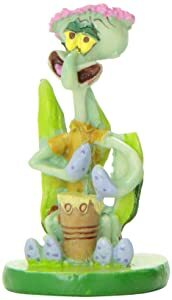 If you’re getting the barrel, you should get this figurine. 5. Plankton: Evil arch nemesis to Mr Krabs. Hates everything and everybody. This is only a minor character that you could do without. 6. Sandy Cheeks: A squirrel from Texas with a love for science. This is also a minor character that you can do without. 7. Squidward Tentacles: Spongebob’s neighbor. Grouchy and negative, hates Spongebob. His Easter Island Head house makes a great ornament by itself but adding him to it will complete the set. (8) (9) (10) are cave aquarium ornaments. 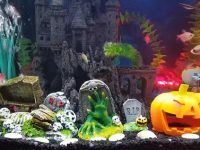 Caves play an extremely important part in fish tank decor and if all you have space is for one ornament, then you should select a cave. Caves provide your fish a little hiding hole when they get stressed and this is especially crucial if you have territorial fish in your tank. 8. Pineapple House: This is where Spongebob lives. I have seen two types of Pineapple House ornaments, one with holes and the other a solid ornament. 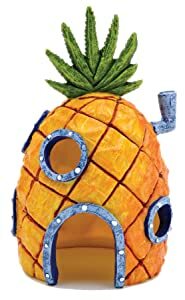 If you choose to incorporate the Pineapple House, match it with a figurine of Spongebob for a complete effect. 9. 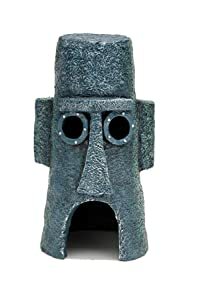 Easter Island Head: This is Squidward’s house. I would say that this is my favorite among all the caves. The Easter Island Head is very artistic and goes well with a number of other themes. 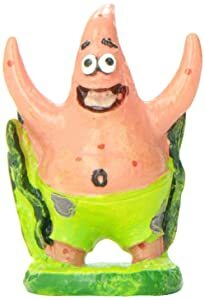 Place a Squidward figurine for a better effect. 10. 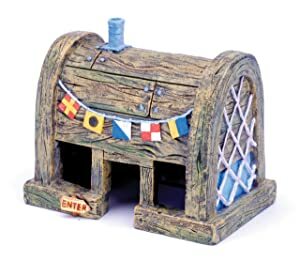 Krusty Krab: The Krusty Krab is a burger joint belonging to Mr Krabs. This is also where Spongebob works as a Fry Cook. It looks like a barrel on its side and is very decorative. The holes into it can be a little small for medium to large fish though. 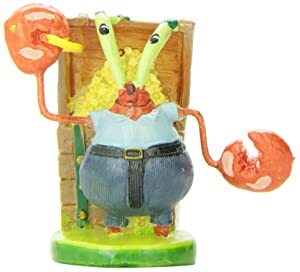 If you are selecting this, a figurine of Mr Krabs would be a perfect combination. To make this theme work, you should have a little knowledge about the cartoon so that you don’t match the wrong decorations together. If you have never ever watched this cartoon, I would suggest you go over to YouTube and watch a couple of clips now. But a fair warning, they are addictive. 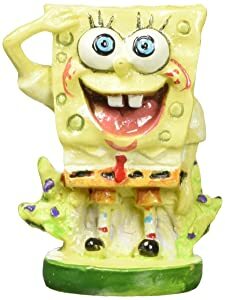 Spongebob is a yellow sponge that lives in a Pineapple house. Squidward is a squid that lives in an Easter Island Head house. Mr Krabs is a crab that runs a restaurant called The Krusty Krab which looks like a barrel on its side. Spongebob’s best friend is Patrick, a pink starfish. If you have both these fish tank decors, put them together. Squidward hates Spongebob. If you have both these aquarium decorations, place them apart. 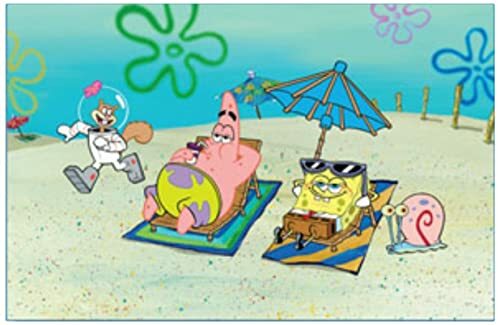 Other minor characters in the cartoon include Sandy Cheeks (a squirrel wearing a dive suit), Pearl (Mr Krab’s daughter, a whale in a cheerleader outfit), Plankton (a one eyed plankton, Mr Krab’s arch nemesis) and Mrs Puff (a pufferfish, the Boating School teacher). 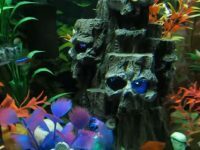 Knowing the right combination of aquarium decor will make your fish tank design more pleasing and accurate. 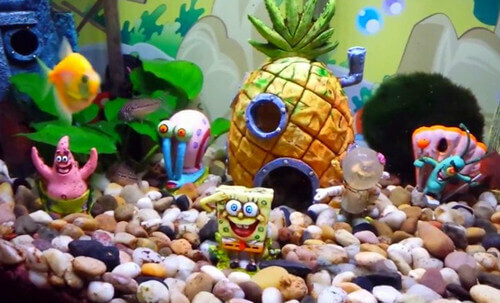 A Spongebob aquarium background would be the perfect backdrop for your aquarium. It will really complement the theme. As for the substrate, a good idea is to use medium sized gravel. Plain colored would make the look original, because that is what it looks like in the cartoon but if you want a cartoonish effect, you could get colorful gravel. Aquatic plants aren’t necessity in this theme because there are none of them in the cartoon series. If you do want to add plants, add the ones that do not throw the attention off the ornaments or hide the backdrop. Remember to properly wash and sanitize the items before adding them to the tank to remove any chemical residue that may have come from the factory. First, placing the main figurines beside their homes. 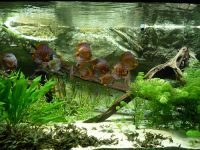 I would suggest arranging them on your table first before placing them into the tank so that you can see the effect before the final decision. For a small tank, just one cave and maybe one figurine. Decide on which character you prefer and match the items. For a medium tank, two caves and about three figurines. More than this would make it look cluttered. For a large tank, you can have the complete set of characters. Just don’t have more than one of each or it would look odd.